In my book Punjabi Khana we have made abundant use of authentic Punjabi spices and ingredients such as ghee, butter and cream to provide the same appealing flavours. The book is a vegetarians delight as some of the popular non-vegetarian Punjabi dishes are modified the veggie way just for you. The recipes in this book have been divided course wise in to 7 sections for easy reference. The first section is Shubh Shurvat, which includes a list of delicious lassis. It is followed by a selection of starters, snacks and shorbas in Lajjatdar Shorbas and Snacks. In Subzi Di Dawat you will find a collection of 23 tasty Punjabi subzis that make use of bountiful vegetables and greens. A whole section Masaledar Dal Ke Tadke is dedicated to the versatile dals. Roti Aur Basmati Da Khazana provides a selection of authentic Punjabi breads and rice preparations. Chaat aur Salad da Thela and Dadi Maa ke Achar include a variety of chaat, raita and achar recipes. 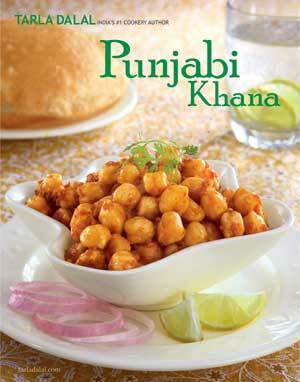 An array of delicious Punjabi sweets is included in Kuch Meetha Ho Jaye section and lots more. The recipes are presented to you in a simpler version to make your cooking joyous and provide an elaborate Punjabi Khana in your kitchen for you and your loved ones. Take complete advantage of this book, chose your pick from the mouthwatering recipes!